Looking for a home wiring or wireless networking solution in Bernardsville, Summit, or Morristown New Jersey? The Wireless Network in the home is more important than ever. With all of your devices and all of the expanded capabilities (streaming music and video from services like Pandora, Hulu, Amazon or Netflix) your wireless network needs to be highly efficient. Don’t rely on your broadband provider’s wireless equipment. Check signal strength around your home and upgrade, as needed. Future Home will improve your wireless network by installing leading edge routers and boosters. Your home audio and theater equipment iare part of your home network, tied into your computers and the Internet. Future Home Technologies will help you plan and build the right technical infrastructure so that you can take advantage of new capabilities—all from an iPad or smartphone. Having Future Home Technologies install your structured home wiring and networking will keep you ahead of the technology curve. We specialize in low-voltage wiring, so talk to us while your walls are open. If you don’t know how much structured home wiring to do, do more. It’s relatively cheap and provides the highest speeds. For existing houses, home wiring and home networking is more complicated. You need experts like Future Home Technologies to balance the right combination of wired and wireless solutions to match your needs. Whether it’s wiring your whole house, wiring for DirecTV or cable, or installing a computer network, call Future Home Technologies today. 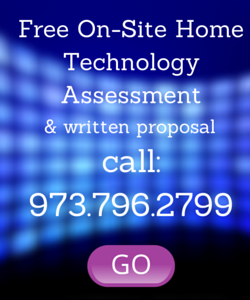 Contact us for all your New Jersey Wireless or Wired Home Network solutions!